I received some criticism from my tutor on Project 3 – the Decisive Moment, some of which concerned the amount of distracting detail behind and around the main subject. It was suggested that I made use of the dodging and burning to isolate my subject more within the picture. 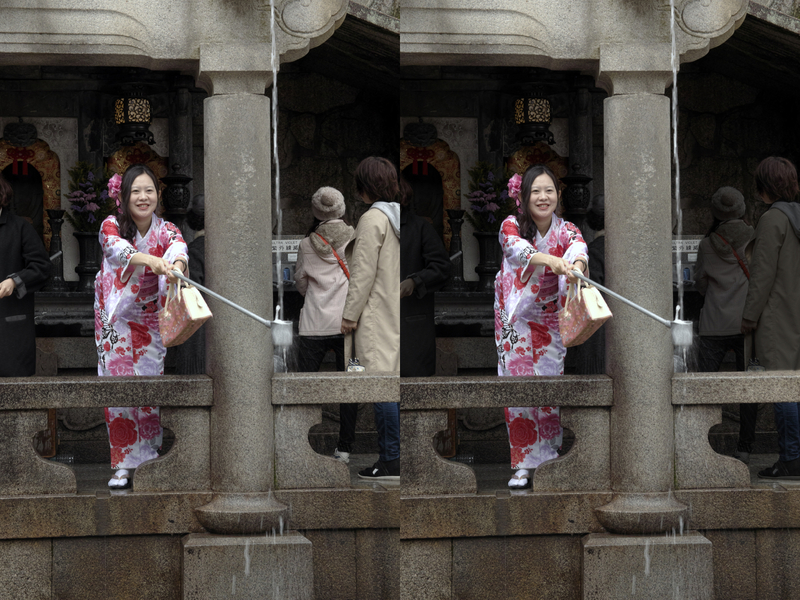 As an example I have modified the images of the kimono-clad lady taking the waters at Kiyumizu-dera temple in Kyoto. Here I have reduced the luminance of the background and the jackets of the people behind the subject in order to make them much less intrusive. Here is the result, showing both the original image and the modified result. To me, the decisive moment is all about what happens in front of the camera just at the moment you press the shutter release. The right moment can make the difference between a mundane photograph and something special, or at least improve it. Sometimes it’s a matter of pre-arrangement, sometimes it’s a case of waiting until something happens, but often, as with Henri Cartier-Bresson’s Derriére La Gare Saint-Lazare, it’s purely a matter of luck.